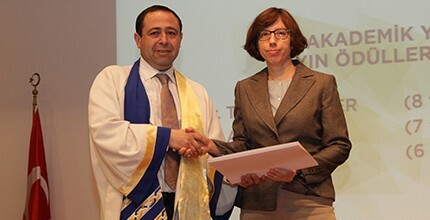 Prof. Dr. Anne Frary was honored with Izmir Institute of Technology 2015 Academic Performance Award with 7 publications. Molecular genetic diversity and population structure of approximately 500 fababean accessions will be examined in collaboration with Polen Seed Co., Manisa. This project is supported by the Turkish Ministry of Science, Industry and Technology (SANTEZ PROGRAM). In collaboration with the Aegean Agricultural Research Institute, the first Turkish processing tomato hybrid was developed. This hybrid is high yielding and had high soluble solids. Seed available from Polen Seed Co. For further information contact Dr. Oner Yesilkaya.